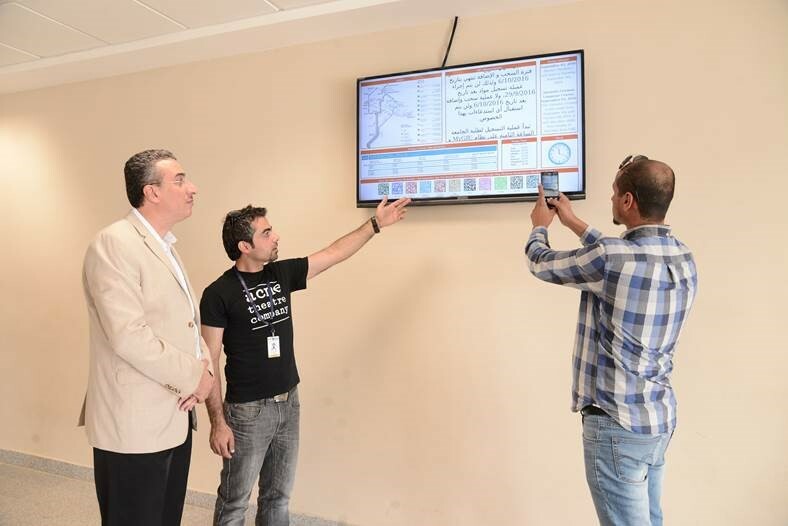 The ISTC team developed an Information Display System (IDS) in-house to display announcements, school news, images, and other information on TV screens that are mounted in lobbies, squares, hallways, and cafeterias in the university. The GJU Intranet infrastructure (including a firewall, links, and switches) is utilized to secure and transmit the displayed content from a web application on a server in the data center to the web browsers on the Raspberry Pi devices that are connected to the screens. The development team at the center implemented the dynamic web page (i.e., dynamic web application) that is displayed on the screens and the content management application that is used by administrators to manage the dynamic content on that page. Moreover, users may interactively scan QR code images displayed on the screens using any QR code reader that is installed on their smartphones to easily access common websites and GJU Wi-Fi without the need to remember their corresponding URLs or credentials. This project saved GJU thousands of dinars in development, software, hardware, and labor costs. As the applications were developed in-house, the used software is all free open source, the used Raspberry Pi devices are very cheap (about 50 JDs each), and the needed hardware (screens, devices, cabling) was all installed by the ISTC engineers. This work would have not been possible without the help of the staff of ISTC in managing the project and specifying its requirements - Dr. Feras Al-Hawari, implementing the applications and configuring the Raspberry Pi devices - Mr. Hadi Etawi, and none the less Mr. Tamer Hyasat, Mr. Mohannad Alhalahleh, and Eng. Hamzeh Noayran for helping in mounting and powering the screens and interconnecting them to the Raspberry Pi devices and network.